FOOD PRODUCTION, home energy generation, water storage, food preserving, travel by bicycle — all familiar practices to retrourbanies. These are good initiatives, we know, yet all-too-often they are presented as one-offs disconnected from their urban, social and political environments. The good thing, the significant thing about Happen Film’s new production, Degrowth in the Suburbs, is that it contexts retrosuburban ideas within the economic, environmental and political context they exist in. The 15 minute video takes us into Sam and Helen’s life in their detached suburban home and garden in Coburg, a suburb of Melbourne. The video reveals that Helen was already taking a number of retrosuburban initiatives when the couple got together. Through his studies and skills, Sam accelerated that process to create what they call a life of sufficiency. What is that? Well, as the couple explain in their voiceover in the video, it involves things that will be familiar to people interested or already participating in what we might call retrosuburban living. Their garden has been repurposed for urban food production, including a flock of chooks and a few ducks. A substantial photovoltaic installation produces the electricity they need with enough left over to supply the grid. 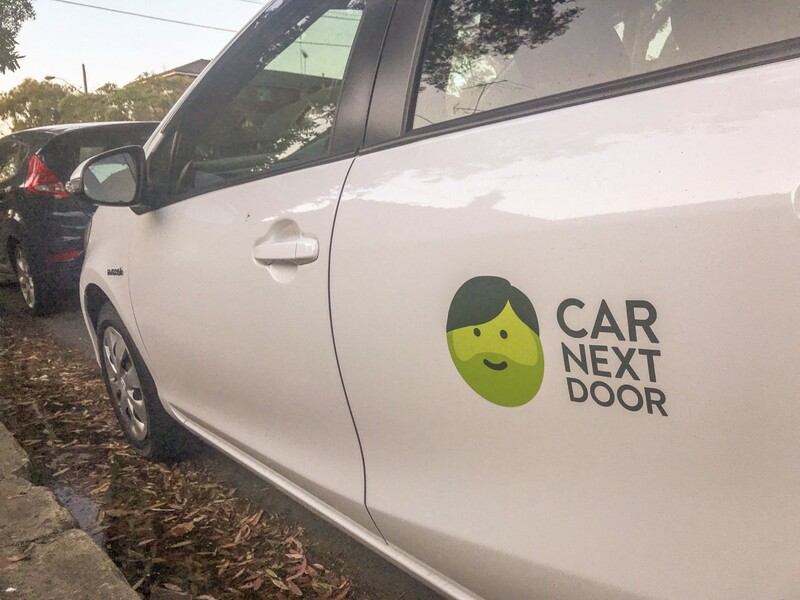 They practice composting, waste minimisation, travel by bicycle and, because they now use their small car less, make it available for renting on Car Next Door, which, as the permaculture principle suggests, produces a (financial) yield. They also home-brew beer. Many people taking a similar path will do at least some of these things. Those with a rooftop photovoltaic system might have a home battery to supply their electrical energy needs and disconnect from the electricity grid. Whether disconnection is a good idea was raised by Josh Byrne. One-time ABC gardening presenter now home energy systems and landscape consultant in Perth, Western Australia, Chris was showing us his home photovoltaic and battery system when he explained that he produced more energy than his home uses and it therefore made sense to sell the excess to the grid. Doing that puts more renewable power into the state’s energy supply. What makes this Coburg couple different is their disconnection from the urban gas supply. Now they produce their gas energy needs from a small biogas generator. This they feed with vegetable waste which is converted into combustible gas via anaerobic (without oxygen) degradation. However, as many people find when it comes to producing compost for the home garden, they don’t produce enough waste to feed the digester. The solution comes through a different version of dumpster diving when they cycle to the local fruit and vegetable market to salvage biodigestable waste from the skip. Sam’s journey was influenced by reading Henry David Thoreau and other books on non-materialist living, sustainability, social justice and associated topics. The reading led to insights into the politics and macroeconomics of sufficiency and to the couple’s household experiment of now-more than a decade. In the voiceover to images that would be bucolic were we not in a suburban setting, Sam says the lifestyle they developed is about exchanging consumption and all that is needed to support it for freedom and time. That’s a deal that works well. They both work part-time and this brings sufficient income to support their lifestyle. Where Degrowth in the Suburbs differs from so many videos on resilient living, and many of the reports we read about people pioneering such lifestyles, is how it links the couple’s lifestyle to the big picture. The commentary offers a political-environmental analysis of world trends. This is not some quasi-academic analysis full of jargon, but a simple connection of the home to the world at large. It has become the responsibility of individuals, households and communities to drive change, Sam explains. That is not the best or most efficient way to do it, he says, however government has forsaken its role, many would say its responsibility, in doing it. What households and communities can do to change the trends that are the source of so many problems, both globally and locally, is limited. Household action is not enough to change them because the problems are systemic and structural, Sam says. The only way households can change structures is by community engagement for collective action. It is refreshing to find someone who understands the big-picture socio-political context of what they do and who knows the problems of the world will not be solved by gardening or by households simply doing their own resilience-thing no matter how good it might be. Approached alone, that ends up as a multitude of resilient, island-households unconnected with one another in any substantial, collaborative way and thus unable to influence the socio-economic and political systems that hold up the system whose problems they try to solve, although they could influence cultural practices. We should practice our values in our context, whatever that might be, Sam says. An economics of sufficiency will not emerge until there is a culture that demands it. A socially-savvy breath of reality comes into Degrowth in the Suburbs when Sam explains that the lifestyle they have developed with its sufficiency, home-grown food, home-produced energy and other practices is not available to all. They have been in their home for a decade or more. Today, they would not be able to afford to purchase their house, Sam says. The message: it is important to recognise the unaffordbility of home ownership is a barrier to sufficiency in the suburbs. Sam admits they are privileged. It is this privilege that David Holmgren, too, says is a prerequisite of the retrosuburban lifestyle in his book, Retrosuburbia. He identifies the possession of what are a sufficiency of financial, temporal and mindset resources as properties of people treading the retrosuburban path. Despite this, people without those resources will adopt and adapt David’s ideas to their own circumstances. How much that differs from whatever they have been doing to implement permaculture, we will see. Retrosuburbia, like Transition Towns a decade ago, is a reinterpretation of permaculture with a more-focused application. Access to resources is both opportunity and barrier to attracting people to the way of life. It is an opportunity for those who own their home or who have the financial resources to acquire one and set foot on the retrosuburban pathway. It is a barrier for those without the resources and who, because of that, may never tread that path. 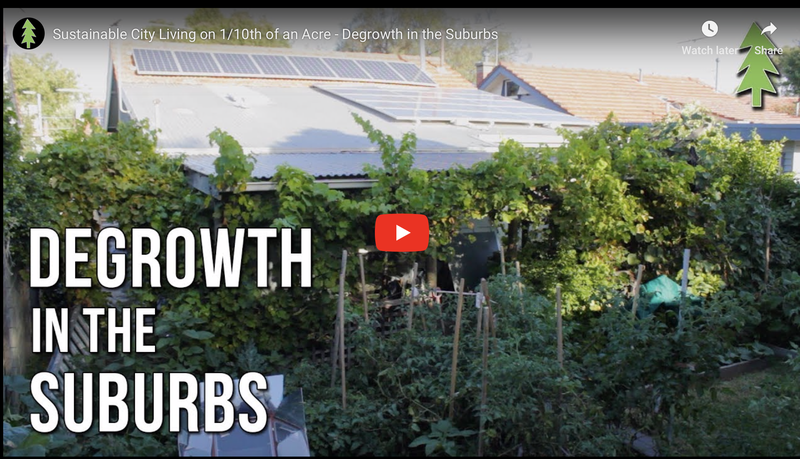 Degrowth in the Suburbs is another inspirational video from Happen Films. It is inspirational because it shows the different initiatives homeowners can take towards a more-sufficient lifestyle. It shows that those with property or with access to it and the ability to make changes can create a satisfying lifestyle and a sense of security in life-resources in the suburbs. Significantly, the video briefly discusses the political economy of the retroretrosuburban lifestyle. This is important because it is what determines who can and cannot adopt a lifestyle of retrosuburban sufficiency.